I have a fun story to share with you all this week - another before and after! I completed this furnishings project earlier this year, and it is one of my favorites to date. 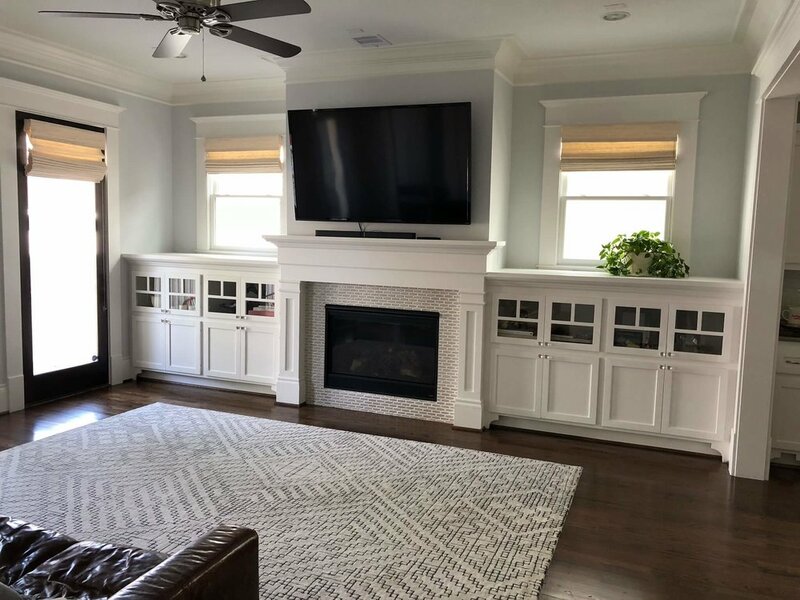 These clients are young and fashionable, and wanted a family room to really tie together their BEAUTIFUL newly purchased home in the Houston Heights. Keep in mind as you scroll through these photos - we did absolutely nothing to the existing shell of the room! Paint color stayed the same, and no changes to the millwork or built-ins. We did however, change the decorative lighting and added woven wood shades to all of the windows. It just goes to show that new furnishings can absolutely transform a room! As I mentioned before, this home was newly purchased by my fun clients, so their family room was truly a blank slate. 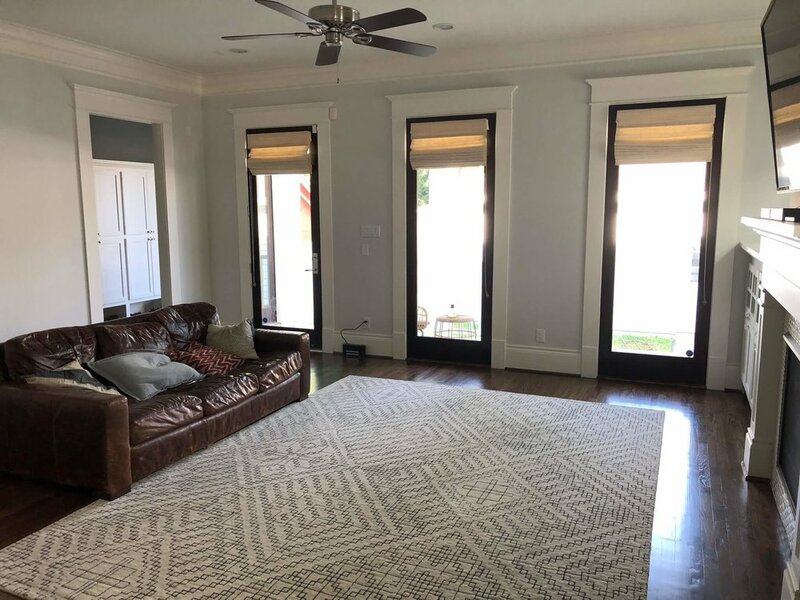 The only piece that needed to be incorporated was their awesome area rug (linked below). We started to discuss their style dreams for the room - and I knew right away that this was a good fit - because she really wanted the Studio McGee look. Yes! I have followed and loved Studio McGee for years, and absolutely adore their fresh aesthetic. I would best describe the style as livable, refined, neutral with interesting textures, a bit eclectic, with an occasional bohemian touch. As for the layout of the space, we wanted to maximize seating, while keep an open and welcoming feel as you enter the space from the entry/kitchen. Take a look at the family room before. My first task as always was to configure the furniture layout. 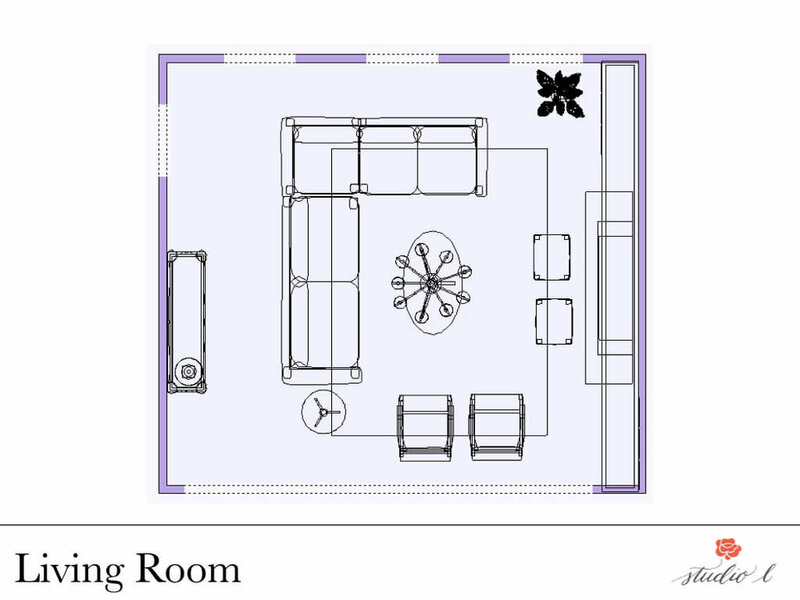 As you will see in the furniture plan below, my recommendation was a large, comfy sectional to really anchor the room. This big boy sectional can comfortably seat 6-7! The proportion and dimensions were perfect for the open concept space. All of the pieces needed to be centered on the fireplace and TV wall, so I planned for 2 comfy arm chairs off to one side, and then an oval cocktail table (easy to walk around to get to the sectional) centered under the stunning chandelier. I then added an end table by the sectional, and two accent stools positioned near the fireplace for extra pull-up guest seating. Behind the seating group, I planned for a console table "moment" - the perfect spot to set your keys/bag as you enter the room from the back, and it was also a good opportunity to help visually fill up the really large back blank wall. Ok, so take a gander at these after pics - an insane transformation, right?! 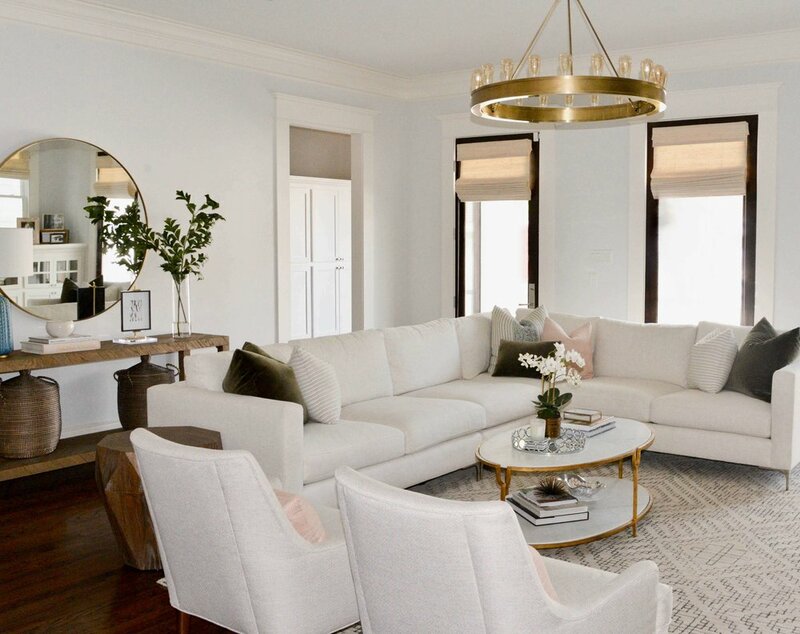 This beautiful home in the Houston Heights is so functional (did I mention Crypton fabric protection on all of the upholstery pieces?!) and warm and chic, yet livable. This is the room where you want to hang out and kick it with all of your peeps. Their precious sweet dog, Harvey, really loved the transformation too. If you are loving this vibe and want to recreate it for yourself, I've included shoppable links below, for the exact items in this space or really close substitutes. I think my personal favorite is the console table/round mirror moment on the back wall. Oh, and ALL of the lighting.